I started making photographs in 1967, when I was about fifteen years old. A friend had been given a darkroom outfit for Christmas, and he got me interested. By the time I had graduated from high school, I had taken a few thousand negatives. Most of these were for the school newspaper and yearbook. Probably everyone knows how extremely moving photojournalistic photography can be. Not mine. Few of mine even communicate what was happening unless they have a caption. There is not one that I would be happy to put my name on today. There were a few hundred which I took simply because I liked taking pictures. Almost all of these are ordinary at best, what you might expect from a teenager learning his craft and learning how to see the world around him. Because they helped me learn, they were worth taking then, but not worth looking at now. “Giraffe” is one of only two exceptions. (The other is “old Door”.) 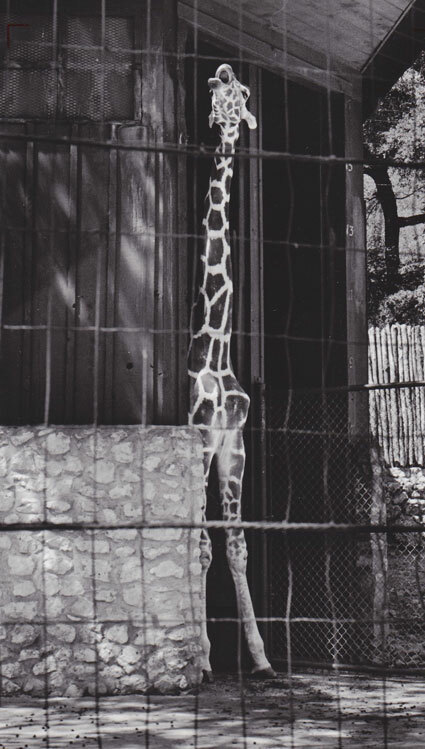 Even when I exposed the negative I realized that this would be more a photograph of patterns than a picture of a giraffe.